Amid the turmoil that is looming in the form of the FOMC decision, the Swiss National Bank stands by, ready to act in order to avoid a massive strengthening in the franc that threatens to severely harm economic activity. Its current soft peg has been in place for months since the abandonment of the hard peg and remains largely intact and easier to defend especially with the recent gains in the euro. However, on a longer-term basis, more action from the European Central Bank could once again put pressure on the alpine nation and force the Central Bank to act by cutting rates further into negative territory. The Federal Reserve is likely to set the tone for the rest of the year in its decision, which is still not assured. Financial markets have been especially choppy in the month of December as investors square off positions in advance of the New Year. Below average trading volumes and diminished liquidity have seen increased jumpiness, especially in light of the ECB decision and now the upcoming FOMC decision promises to be one of the biggest developments of the post-crisis years. While Fed Funds futures continue to point to the probability of a rate hike, currently pricing a 79% chance of a 25 basis point raise, there still is some uncertainty running into the event. The upcoming CPI reading could very well be a game-changer in spite of the fact that the preferred measurement of the Federal Reserve is PCE inflation. From a credibility standpoint the Central Bank has no choice, however from an economic standpoint, it could tip the American economy back into recession. The dollar remains one of the top-performing global currencies, with the dollar index rising 10.45% year over year. By comparison, the dollar has only gained 1.94% against the franc, erasing much of the year’s gains in the last few weeks on the back of profit-taking that has kept USD performance largely negative. Adding to the negativity in USDCHF was the perception that the Swiss National Bank would act in line with any easing developments from the European Central Bank. As a result, when no such actions were taken aside from the deposit rate cut, the SNB was not forced to move on additional accommodation. However, the SNB does believe that the franc is substantially overvalued according to its latest press release. In light of the stagnant 3rd quarter growth and revision lower in the global growth outlook, they could take additional action in the coming weeks to maintain or weaken exchange rates further and keep the economy insulated. 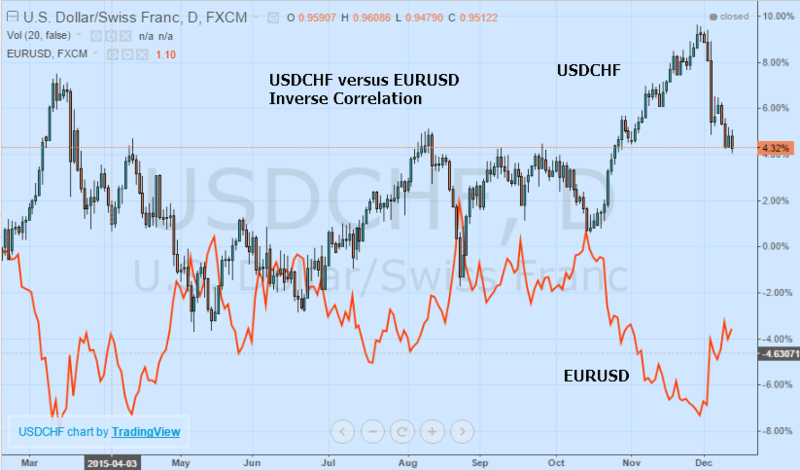 It is very important to recall that since the SNB continues to try and peg the franc to the euro between 1.0500-1.1000 in the EURCHF pair, any move in USDCHF has a strong inverse correlation with corresponding moves in the EURUSD pair. A move lower in the euro consequently moves the franc lower against the dollar, helping USDCHF momentum higher. The most recent CFTC data shows that speculative positioning remains net short with outstanding short contracts rising to 25,500 from 24,800 in the prior period. Since rising to net long back in October, investors have once again shifted net short with short contracts rising to the present level adding to further potential losses in the currency over time. However, should the euro remain strong for the time being, USDCHF could continue to tumble leading up to the FOMC decision. 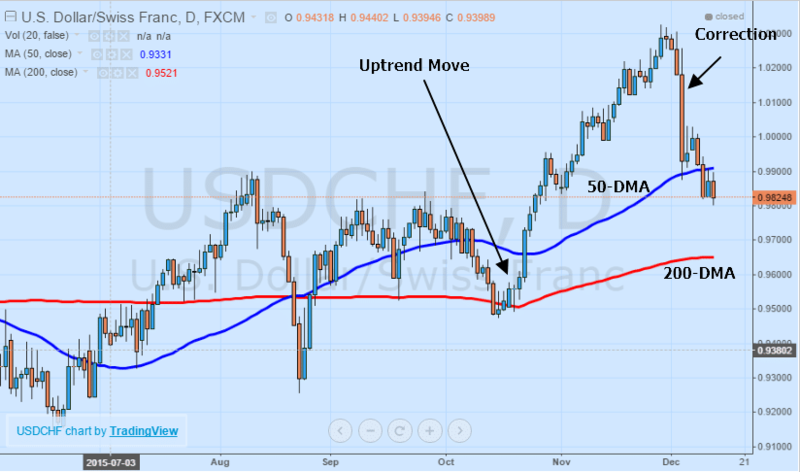 The USDCHF pair looks firmly in correction territory with respect to the prevailing uptrend. Since the near 850 pip leg higher that began in the middle of October, the pair has pulled back substantially, retreating about 500 pips marking a 58% retrace. It remains well within the boundary of a 30-60% correction based on the move higher for technical analysts. Should the pair move below 0.9690 it might spark a reversal lower from the prevailing trend after a 75% retrace. Moving averages are currently mixed in outlook with the 50-day moving average serving as resistance while the 200-day remains supportive of upside. Long-term call positions on expectations interest rate normalization might be better suited at a lower level considering the possibility of a continued pullback. A hawkish FOMC would see the USDCHF likely clear 1.0000 while a dovish FOMC would see the pair tumble below 0.9500. Despite the recent weakness in the USDCHF pair, there is substantial upside potential especially in light of the upcoming FOMC decision which may spell an epic dollar rally heading into 2016. As expectations of action rise going into the vote, the dollar might start to firm up in anticipation. However, a dovish decision will undoubtedly see the pair tumble further, especially if it leads to additional gains in the euro. However, with the probability firmly on the side of action, another modest pullback might prove the perfect entry point for call positions targeting a return to 1.0000 in the pair and higher on the back of a tightening cycle. All eyes remain firmly on the Fed as USDCHF remains firmly guided by the outlook for US monetary policy.